The Node is an unassuming white cylinder, but it packs a punch: this difficult-to-describe device can detect carbon monoxide levels, find your perfect shade of paint and tell you when your laundry is done. Variable Tech, the company behind Node, refers to its creation as "the Swiss Army knife of sensors." The base model, which sells for $149, can be coupled with add-on sensors to record data about moisture, colors, temperatures and more. Node is the project of George Yu, a former contractor at NASA and the Department of Homeland Security who used Kickstarter to raise $76,000. That cash funded the first manufacturing run for his Chattanooga, Tenn., company. The Node is now in full production, and Yu showed it off at the Consumer Electronics Show in Las Vegas (CES) last week. "It's a highly flexible, advanced, sophisticated tool that will advance as time goes by," Yu said. He's right -- but that complexity makes Node a bit confusing to explain. The $149 entry-level Kore module is the size and shape of a roll of quarters. It includes the basic Node components: an accelerometer, magnetometer and gyroscope, plus a battery and 2 MB of memory. Users can buy extra sensors to use Node in other ways: to test hot cooking surfaces, measure motions, or blast a bright light. Node pairs with Apple (AAPL) iOS devices through a Bluetooth connection, and uses Variable's official app (or third-party apps that use the company's integration hooks) to display, record, and email the data. Android support is forthcoming. So far, the base Kore and five extremely varied sensors are available. Kore: The unit's 3-axis sensors -- gyroscope, magnetometer and accelerometer -- each maps to a graph on Node's app that updates in near real-time. Yu showed off the motion-sensing power of the accelerometer during his demo: He gripped the Node, and an animated block on the app moved in tandem with the slightest twitch of his hand. It could be used as a motion-based remote control, he suggested, or by physical therapists to test their patients' fine motor skills. Node can be set to alert users when it starts or stops moving. Put it on top of your dryer and it can send you a message when the cycle is done. Chroma: The $75 Chroma sensor screws onto the Node and captures "true colors" with 99.99% accuracy. See a color that you'd love to paint on your wall? Place the Node against the item, and the Chroma sensor will spit out the color values in CMYK and other formats. A third-party app will show you the closest paint swatch from brands like Behr and Martha Stewart. Therma: The Therma, which also sells for $75, uses an infrared sensor to check the temperature of items that can't be touched or reached: the heat of heavy machinery, or areas of the home that may be poorly insulated. Clima: This $50 sensor detects barometric pressure, ambient light, wind speed, temperature, and humidity. A hiker can check her elevation while moving up a mountain, or a contractor could test the humidity level in a client's basement. Luma: Node bills the Luma as a "state-of-the-art flashlight" that uses eight LED lights. Users can select how many lights to turn on and assign them a flashing pattern. It's not nearly as varied as the other sensors, but it's also significantly cheaper at $25. 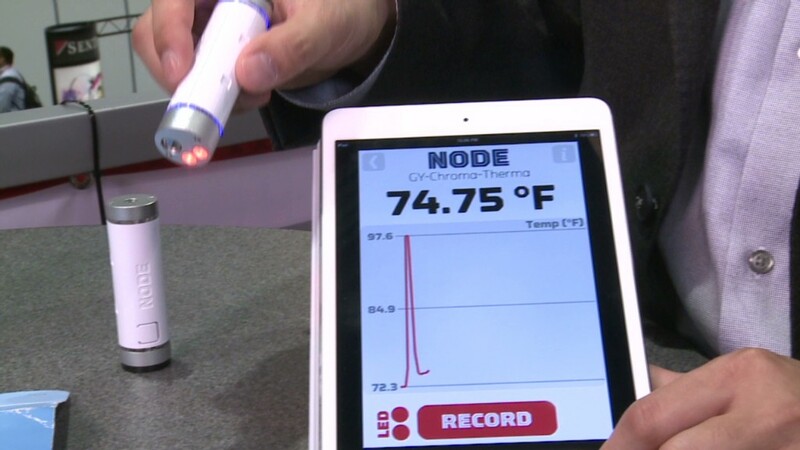 Oxa: Yu wasn't able to demo the Oxa at CES: It's an industrial-grade gas sensor. The default Oxa, priced at $149, senses carbon monoxide. Other, separate sensors detect chlorine, nitric oxide, hydrogen and other gases. They're currently available for pre-order and should ship in 3-4 weeks.